Now you can share comfort! 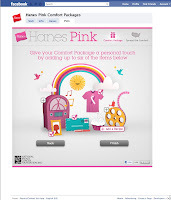 Head on over to Hanes on Facebook and check out the Pink app. Here you can send a virtual comfort package and special message to your loved ones. Since 2009, Hanes has made cash and in-kind donations totaling $1,000,000 to breast cancer charities. 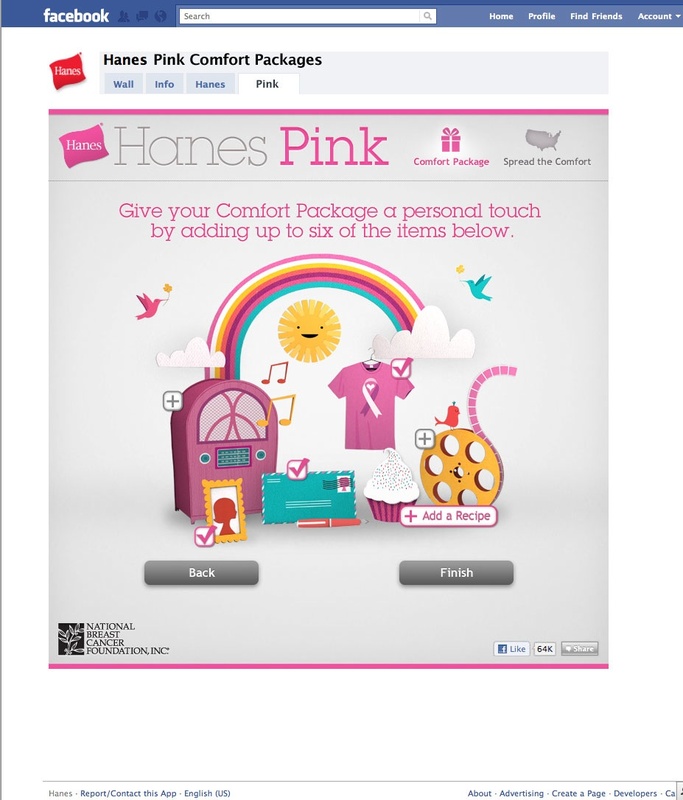 When you send a comfort package Hanes will donate $1 to the National Breast Cancer Foundation, Inc (up to $25,000). 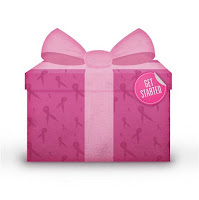 This will help to promote early cancer detection and provide mammograms to those who can't afford it on their own. We love it when we are thought of, and someone takes time to send us a little note or tells us they are there for us. It can be very comforting to us. Hanes knows this too. Hanes created the Comfort Packages to bring a smile and help spread comfort to fans’ social networks in a small, but impactful, way. The comfort packages are fully customizable with photos, videos, recipes, T-shirt designs, music and messages. These FREE comfort packages are a great way to send your friends and family something to comfort them and let them know that they are thought of and loved. I participated in this campaign as a member of One2One Network and am eligible for a prize drawing. All opinions stated in the post are my own. My kids already love to wash their hands, but the SquidSoap now makes it so much more fun. It gets my kids on a mission to really get their hands clean. "SquidSoap features an ink marker located on top of the pump dispenser so that when the pump is pushed down to dispense the soap, the hand is marked with an orange dot. The mark washes away with a 20 second wash, ensuring clean healthy hands!" The first time my son used this soap the ink spot did not wash off within 20 seconds. After trying a few different things we discovered that maybe the ink spot was getting to dry and/or my son's hands weren't wet enough. My tip to you would be to make sure your child's hands are very wet before pushing on the stamp. It even helps to make sure the stamp is moist by dripping a little water onto the stamp as well. This soap really suds up on the hands and my kids love washing that stamp off their hands. 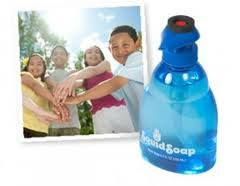 SquidSoap is great for older children that already know to wash their hands; they're just in a hurry, don't think about it, or haven't instilled proper hand washing as a natural part of their routine. SquidSoap helps change behavior, so that over time good hand hygiene becomes a natural, unconscious action. You can find this product at Crowley Jones stores for an awesome price or on Amazon.com. To see if it's at your local store check the map on their website. You can check out the FAQ section of their website for more info. I received SquidSoap from the folks at Soaptime for the purpose of this review & giveaway. What a great concept! You don't have to buy a whole new pair of shoes when you are tired of the look you're sporting. If the soles are still good, change the top...HELLO! Zipz shoes are the next generation of shoes. Here's what I have to say: These are the coolest shoes I've ever seen! My daughter loves them and has to show everyone she meets how she can unzip the top of her shoes. If you're grown and your feet have stopped enlarging, then you can purchase a pair of soles and then a variety of different tops. You can wear hi-tops one day and low sneaker the next. You can wear a different color or design. THIS PRODUCT IS SO INNOVATIVE! I want to get my daughter another cover for her shoes so she can switch it out with the one she has. She tells me that they are really comfortable so that's a good thing! I can honestly say that this is her favorite pair of shoes to date. My 8 year old now wants a pair for himself! I shall add that to the Christmas list. You can become a Zipzter too! Check out their website and find a pair that's perfect for you. Don't forget a cover to change the tops. It's almost Christmas already!!! I can't believe it either! Where has the year gone? Here's a little gift idea for the young guys in your life that love to play with trucks. Defiants 4x4s are mighty, mini, motorized 4x4s that can take on any challenge! Pocket-sized Defiants 4x4s have REAL gears, for Power, Speed and Freewheeling Action. If your boy is anything like mine, then he loves watching things move and go. Then he of course likes chasing it! Defiants 4x4s automatically shift into freewheeling mode for insane stunt jumps or reckless downhill runs! And blazing headlights light the way! OH YES!!! Lights too! Can it get any better? Lights and motions are my son's favorite in a toy! The Defiants FlexTerrain system is fully modular, with play sets and accessories that can be customized into endless configurations. Each play set connects with every other set for rich, off-road action and expanding play value. 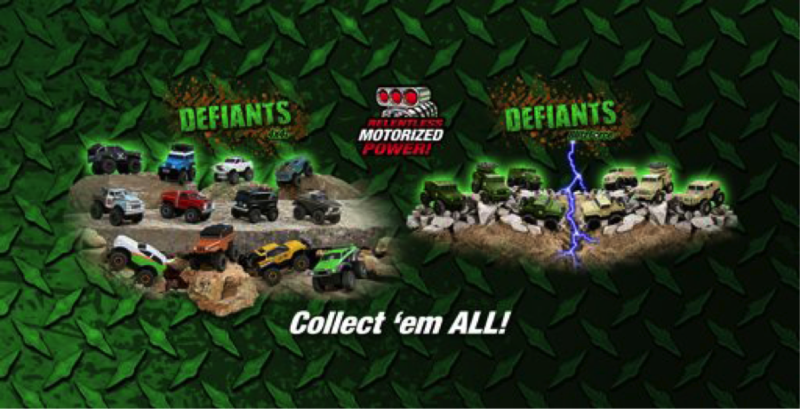 Defiants BlitzForce military-themed vehicles and play sets honor the spirit of freedom and power that kids love. The first wave of over 50 collectible styles for 2011 began to arrive in stores over the summer. 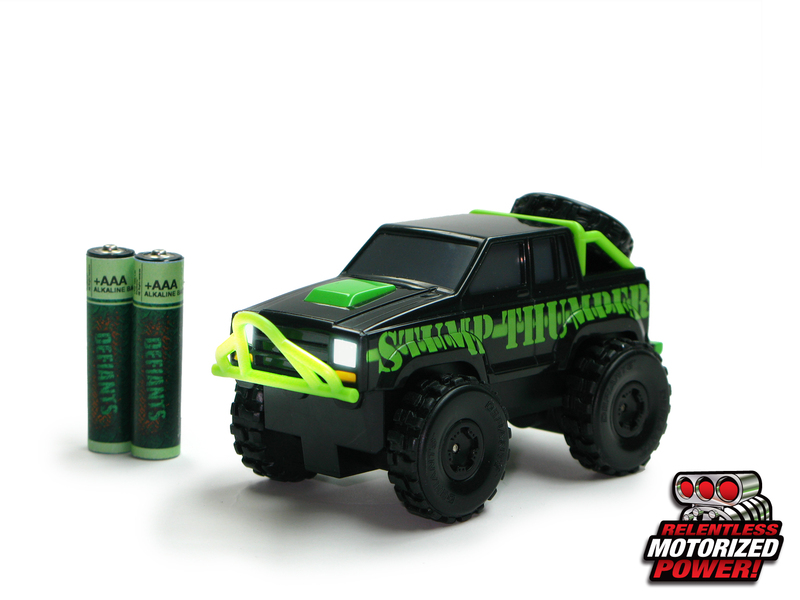 Vehicles are powered by two AAA batteries. Now through November 5th, they are on sale at Target® stores throughout the country! 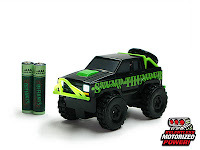 These pocket-sized vehicles have real gears for Power, Speed, and Freewheeling Action! Normally priced at $7.99, Defiants 4x4s have been reduced to $5.99! What an awesome deal!! That would be for the single pack option. You can also purchase a 2 pack for a slightly higher cost. I am definitely considering grabbing some to put under our tree this year! The recommended age for this item is 4 and up. 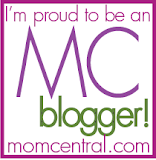 My children and I had a chance to try out some yummy organic lollipops by YummyEarth. YummyEarth is the #1 organic candy in the US. It is 100% natural and has REAL fruit extracts and planet friendly ingredients. This company was started by 2 dads who wanted to offer their children yummy treats with out all the added chemicals you can find in other candy. You can find more than just lollipops at YummyEarth. These guys invented the first ever USDA Organic gummy bears! I love me some gummy bears! Find a location near you where you can purchase your YummyEarth treats or order from the comfort of your home at Amazon.com. You can also purchase at wholesale prices! Check out their website to see how they make these yummy pops! YummyEarth lollipops were graciously provided to my family for the purpose of this review. Thank you YummyEarth! I: Ice cream is good on a hot day, no?